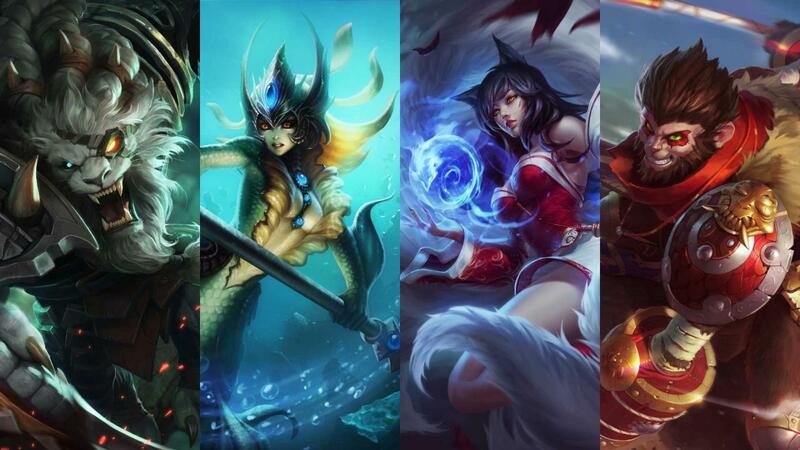 New lore has been added for several Vastaya champions, including Ahri, Nami, Rengar, and Wukong! 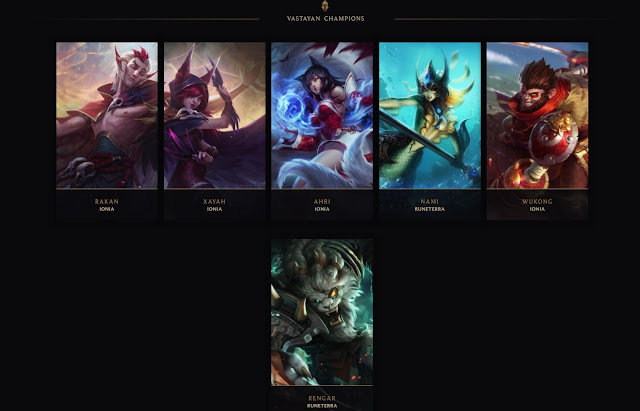 The Vastaya universe page has been updated with several new champion stories and bios for Ahri, Nami, Rengar, and Wukong. "The vastaya are chimeric creatures of Runeterra whose lineage contains both human blood and the spiritual magic of a pre-human race. From the ferocious, bestial power of Rengar to the foxlike allure of Ahri, vastaya can look considerably different from one another, but they all share animal and human characteristics. The vastaya’s origins can be traced back to a hidden corner of Ionia where a group of humans fled in escape of the Great Void War. There, these refugees came into contact with a tribe of intelligent shapeshifting creatures who were greatly in tune with the world’s natural magicks. These spiritual creatures, known as the Vasthayshai’rei, welcomed the human refugees and eventually produced what Runeterrans now refer to as vastaya – a blanket classification for any number of species of chimeric creatures. Over time, the varied offshoots began to settle in different regions and naturally adopted different forms – simian, avine, even piscine – according to the creatures which most embodied their strongest characteristics. In addition to their animal-human forms, vastaya are notable for their extremely long lives. Some have been known to live for thousands of years, while others claim to be immortal. As time wore on and the vastayan bloodline spread throughout Runeterra, an interesting genetic aberration occurred: certain humans with very small amounts of vastayan heritage gained the ability to shapeshift. From the frozen Freljord to the darkest jungles of Runeterra, these shapeshifters can't maintain their animalistic forms for long, yet are still capable of harnessing some of their ancestral magic and change their shape." The page also lists the previously released Vastaya stories for Rakan and Xayah and the Vastaya Field Journal. "The seafaring Marai, the tribal Kiilash - incredible! How many more varieties may yet be discovered?" "Innately connected to the latent power of Runeterra, Ahri is a vastaya who can reshape magic into orbs of raw energy. She revels in toying with her prey by manipulating their emotions before devouring their life essence. Despite her predatory nature, Ahri retains a sense of empathy as she receives flashes of memory from each soul she consumes. Abandoned in the snowy woods of northern Ionia, Ahri knew nothing of her original family save the token they left her: a pair of matching gemstones. She joined a pack of icefoxes as they stalked prey on their morning hunt, and before long they adopted her as one of their own. With no one to teach her the magic of her kind, Ahri instinctively learned to draw it from the world around her, shaping destructive spheres and quickening her reflexes to take down prey. If she was close enough, she could even soothe a deer into a state of tranquility, so much that it remained serene even as she sank her teeth into its flesh. Ahri first encountered humans when a troop of foreign soldiers camped near her den. Their behaviors were strange to Ahri and, curious to learn more, she watched them from afar. She was especially drawn to a hunter who, unlike his wasteful companions, used every part of the animals he killed, reminding her of her fox family. When the hunter was wounded by an arrow, Ahri felt his life seeping away. She instinctively devoured the essence leaving his body, and gained brief flashes of his memories—the lover he had lost in battle, his children from a strange land of iron and stone. She found she could push his emotions from fear to sorrow to joy, and charmed him with visions of a sun-soaked meadow as he died. Euphoric at the rush of absorbing the hunter’s life, Ahri felt more alive than ever, and traveled Ionia in search of more victims. She relished toying with her prey, shifting their emotions before consuming their life essence. She alternated between dazzling them with visions of beauty, hallucinations of deep longing, and occasionally dreams colored by raw sorrow. She grew drunk with memories that were not her own, and exhilarated in the lives of others. Through stolen visions, Ahri watched through their eyes as they pledged fealty to a temple of shadow, sacrificed offerings to a deity of the sun incarnate, encountered an avian tribe of vastaya that spoke only in song, and glimpsed mountainous landscapes unlike any she had seen. She experienced heartbreak and elation in tantalizing flashes that left her craving more, and wept at the massacres of Ionian villagers at the hands of Noxian invaders. Ahri was surprised when the memories led her to discover the tale of an unearthly fox demon. As she absorbed more life essence, she grew to identify more and more with her victims, and felt guilty at ending so many lives. She feared that the myths about her were true—she was no more than a cruel monster. But whenever too much time passed between feedings, she sensed her own power fade, and could not help but partake once more. Ahri tested her self-control by consuming small quantities of life essence, enough to absorb a memory or two but not enough to kill. She was successful, for a time, but was tortured by her unending hunger and soon succumbed to temptation, indulging in the dreams of an entire coastal village. Tormented by her mistake, Ahri could not forgive herself and felt a deep sorrow that forced her to question her own existence. She withdrew to the forest caves, isolating herself in hopes of controlling her relentless desire. Years later she emerged, determined to experience every facet of life through her own eyes. Though she might indulge in occasional essence, she resisted consuming entire lives. With the twin gemstones as the only clue to her origin, Ahri set out in search of others like her. No more would she rely on borrowed memories and unfamiliar dreams." "A gust of wind blew cold night air from the garden, carrying with it enticing scents of overripe fruit and blooming flowers. Ahri stood before the garden's entrance, where stone transitioned to soil and narrow labyrinthine caves opened to the sky in a deep caldera. Thickets of trees and brambles grew wild beneath the moonlight, while flowers bloomed in lush abundance. Ahri hesitated, knowing well the twin nature of danger and beauty. She had heard legends of the sacred grove since childhood, but had never before traversed the southern caverns to find it. According to the stories, those who stepped over the threshold of the garden began as one person and left as someone else entirely, or did not leave at all. Whatever the truth might be, Ahri had made up her mind. As she stepped into the garden, the back of her neck prickled as if someone were watching her. No figure was visible amongst the trees, but the garden was far from still. Everywhere Ahri looked, new flowers bloomed with each passing second. Ahri walked a winding path through the tangle of plants, stepping over roots rumbling beneath the soil. She ducked under hanging vines that reached out to her as if clamoring for affection. She could have sworn she heard a hush from the soft rustling of leaves. Moonbeams shone through the canopy above, revealing trees bearing leaves of silver and gold. Flower stalks entwined around their trunks, curling to display dazzling buds brighter than any gemstone. Plump spicecherries coated in a layer of frost chimed softly as they swayed amid an untamed thicket. A snow lily stretched toward Ahri’s face and caressed her cheek gently. It was too alluring to resist. Ahri pressed her face into its petals to inhale its heady scent. Her nose chilled and she took in the faint smell of oranges, the summer breeze, and the tang of a fresh kill. The blossom trembled as it blushed with color, and Ahri’s breath caught in her throat. She swayed, dizzy at the flower’s perfume. The snow lily fell to the soil, severed at its stem. A viscous liquid seeped from the cut. Ahri let out a breath, her nine tails twitching as her head cleared. Ahri startled as a woman with wisps of gray-white hair stood before her, shears in hand. She was wrapped in colorful shawls and her eyelashes sparkled with dew. As the woman turned her sea-green gaze to Ahri, Ahri felt a strange unease, as if this woman could slice through her gut just as easily as a fibrous stalk. The woman’s face, wrinkled like tree bark, was impossible to read. But Ahri was no longer concerned for her own safety. “You startled me, Ighilya,” said Ahri. In the stories, the old woman was known as the Eater of Secrets, the Forgotten, or the Witch Gardener. Wanting to show respect to one with such power, Ahri decided to call her Ighilya. Great grandmother. “So you are the Gardener,” said Ahri. Little one. Ahri felt uncomfortable at the word, often used in a familial relationship, though she was not sure why. “You seek absolution. Freedom from your pain,” said the Gardener. She stepped over a shrinking fern and beckoned to Ahri. As they walked through the moonlit garden, flowers turned to face the old woman as if she were the sun itself, warming their leaves and helping them grow. Or perhaps the flowers did not wish to turn their backs to her. The old woman waved Ahri to a bench in front of a gnarled cloudfruit tree, and sat opposite her. “Let me guess. You were in love,” the Gardener said, a smile crinkling the corners of her lips. “Ah. A romantic,” the Gardener said. As she spoke the truth aloud, Ahri could not disguise the sharp bitterness on her tongue. The Gardener did not answer. She stood and picked a ripe cloudfruit from the tree and peeled it slowly, carefully, so the rind remained in one piece. The flesh fell into six vermillion segments, which she offered to Ahri. “Even monsters need to eat, you know,” the Gardener said, smiling gently. She placed one of the cloudfruit segments into her mouth, and chewed before making a face. The old woman ate the remaining pieces while Ahri sat in silence. When she was finished she wiped the juice from her mouth. “I cannot stand it,” Ahri said. “To be alive is to be in pain, I’m afraid,” the Gardener said. A vine dripping with snow lily buds wound its way around the old woman’s arm. The woman did not flinch. “I can’t go on knowing that I killed him,” Ahri pleaded. The Gardener reached for Ahri’s hand and squeezed it. Her sea-green eyes glinted in the moonlight, and Ahri detected something she had not seen before - longing, perhaps? 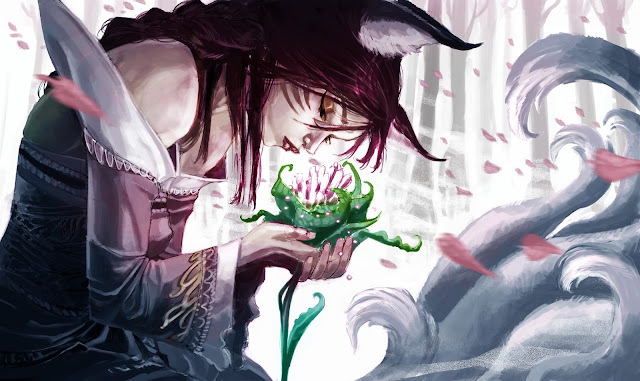 With that, the Gardener offered her arm to Ahri, still entwined with the vine of snow lilies. Buds unfurled like outstretched hands. Ahri held the flower gently between her fingers. The Gardener nodded. Ahri took a deep breath and exhaled into the flower. ...Ahri stood next to a raven-haired man at the edge of a lake. Together they leapt into the water and screamed as they frolicked over endless waves. Ahri’s suffering dissolved like a cloud along with the image in her mind. ...in a forest silenced by winter, Ahri watched a raven-haired man painting a single blossom. “Am I not your flower?” she asked, pulling the strap down from her dress. He lifted his brush and smeared paint over her bare back. The bristles tingled as he recreated the flower atop her spine. “You are, you are,” he repeated, kissing her shoulder with each word. Ahri knew she should dread what would happen next, but her heart was growing cold and numb. ...she stood at the center of a lake, holding the lifeless body of the man she once loved. He dipped beneath the water, becoming contorted through its glassy refraction. Once, this vision would have caused stabbing pain, but Ahri felt no more than a dull ache. ...Ahri leaned over a fallen woodcutter in a stone cavern, consuming his life. At the sound of boots crunching on snow, she startled. The raven-haired man stood, watching. Ahri despaired; she had not wanted him to see this. The memory caught in Ahri’s throat and she stopped breathing, breaking the flower’s spell. No, she thought. I can’t lose this. Ahri tried to inhale, but the air felt like a noose around her neck. It choked her and stifled her throat, as if she were breathing poison. Her vision blackened, but she gasped until her lungs were nearly bursting. Losing this would kill him all over again. Ahri’s knees gave out and she collapsed on the ground, still gripping the snow lily. The unnatural perfume she inhaled from the flower percolated through her mind, conjuring strange and disturbing visions. Ahri hallucinated. In a snow-silenced forest, she envisioned each of her nine tails ripped from her spine, only to grow back so they could be torn off again. In a stone cavern, she saw dozens of portraits of herself painted in inky black brushstrokes. In each of the images, her face was blank and cold. She floated, weightless, at the center of a lake, and looked down to see that the lake was filled, not with water, but blood. In her mind’s eye, she saw a face warped by the endless folds of her memory, one she was already forgetting. The face was blurred, like a painting of a man rather than the man himself. He looked at her, stared into her, but she could not meet his gaze. Ahri opened her eyes. The Gardener was standing above her, holding the vine of snow lilies, which had turned raven-black. “Can you still see him?” asked the old woman. Ahri focused on the hazy shapes in her mind and focused until they materialized into a face. His face. “Yes. It’s cloudy, but... I remember,” said Ahri. She fixed the image of his face in her mind, memorizing every detail. She would not let it dissolve. The old woman’s eyes flashed - not with longing, but regret. “Then you did what many had not the strength to do. You did not succumb to peace,” said the Gardener. Oblivion was a thousand blurry faces staring at her with empty eyes. Ahri tried to stand, but a vine of snow lilies had wound its way around her tails. She struggled against their tightening clutches, prying barbs from her fur, then scrambled to her feet and ran. Knotted roots broke loose from the soil, trying to ensnare her as she leapt between them. A tangled curtain of thorned moon roses swerved to block Ahri’s path, but she held her breath and dove beneath the flowers, which caught wisps of her hair as she tumbled. The path from the garden was overgrown with snow lilies of all colors. Their leaves, sharp as knives, slashed at Ahri’s skin, while thick stalks coiled around her face and neck, binding her mouth. Ahri bit down and ripped through the fibers with her teeth, tasting sour blood. She tore through the archway to the stone caverns beyond. She could just make out the Gardener’s voice. Ahri did not turn back." "The market smelled of burning incense and rotting cabbage. Ahri wrapped her cloak around her nine tails and fiddled with her twin sunstone tokens to distract herself from the stench, rolling them between her fingers and snapping them together. Each one had the shape of a blazing flame, but they were carved in such a way that their sharper edges fit together, forming a perfectly smooth orb. She had carried the golden stones since before she could remember, though she had no knowledge of their origin. Though Ahri was in a new environment, she was comforted by the latent magic buzzing all around her. She passed a stand with dozens of woven baskets filled to the brim with polished rocks, shells etched with legends from a seafaring tribe, gambling dice carved from bones, and other curious items. Nothing matched the style of Ahri’s sculpted tokens. Ahri smiled at him, but shook her head and continued through the market, sunstones in hand. She passed a stand covered in spiky orange vegetables, a child selling fruit that shifted color with the weather, and at least three peddlers swinging tins of incense, each of whom claimed to have discovered the deepest form of meditation. A tall vastaya with feline ears was about to take a bite of a spiced pastry. He froze and stared at the fortune teller in alarm. Beneath heavy layers of incense, Ahri paused at the scent of wet fur and spiced leather lingering at the woman’s neck. Ahri leaned closer with each word. “I’m Hirin, by the way,” the woman said. “Do you know where I might find this craftsman?” Ahri asked. Ahri wrapped her cloak around her shoulders and eagerly followed the fortune teller past her booth, and into a caravan decorated wall to wall with animal skins. She poured two cups of liquid the color of plum wine, taking one for herself. The tea tasted of bitter oak bark, masked by a cloying dollop of honey. Hirin held out a hand for the stones but Ahri kept them close. “Can you tell me where they come from?” asked Ahri, handing them over gingerly. Hirin held them up to the light. Ahri said nothing. She stood frozen with curiosity, and did not take her eyes off the woman. Hirin coughed, and Ahri detected a bitter note upon her breath, as if she had been drinking vinegar. “Ymelo stones are designed as small pieces that fit into a larger sculpture,” she continued. The woman dangled the golden pieces in front of Ahri’s face. “Those are pretty words,” Ahri murmured, staring at the woman. The woman retrieved a hunter’s knife from a cabinet. A low growl escaped Ahri’s lips. She would tear this woman apart. She tried to pounce, but her limbs did not obey. She was rooted in place. Hirin wrapped a bandage around one of Ahri’s tails. Ahri tried to resist, but she still could not move. Ahri shut her eyes and reached out to the reservoirs of magic around her. The environment had plenty ripe for the taking, but she was too weakened by the tea to draw them to her. Instead she reached into Hirin’s mind, which was far more malleable, and pushed. Ahri opened her eyes and stared hard into Hirin’s. They deepened from lavender to violet. “Of course, lady,” Hirin replied, transfixed. The woman’s voice sounded hollow, as though it came from the bottom of a well. She leaned in until her face was only inches away. Ahri inhaled, drawing essences of the woman’s life from her breath. Ahri continued to drain Hirin’s life, sampling memories of raw emotion. They felt rich in Ahri’s mouth, and she relished each unique flavor of emotion. Ahri stopped, her head spinning with renewed vigor. With each memory she stole from Hirin, she felt energy rush back into her weakened muscles, cleansing them of the poison. Strengthened once more, she slowly shook her limbs awake, and flexed her tails with a shiver. They tingled with pinpricks. Hirin stood wide-eyed and dazed, still very much alive. It was she that would wake tomorrow, good as new—less a few memories that she would not miss. With knowledge of the woman’s life, Ahri’s rage had faded. She brushed her hand against the fortune teller’s cheek, then wrapped her cloak tightly around her shoulders and stepped out into the sunlit market. Hirin would not remember her, or their encounter. But Ahri had left the trade with a name to hunt—Ymelo—and the image of the man with soft-winged eyebrows was burned in her mind. "A headstrong young vastaya of the seas, Nami uses her mystical Tidecaller staff to reshape the tides and defend her fellow Marai from danger. The first of her kind to leave the ocean and venture onto dry land, Nami faces the unthinkable with grit, determination, and daring mettle. In the seas to the west of Mount Targon dwells a tribe of vastaya known as the Marai. Long ago, these mermadic creatures discovered a rift in the depths. The rift bore a horrible, creeping darkness which sought to exterminate all forms of life. At the center of their village, the Marai placed a glowing rock known as a moonstone, which is said to be infused with the celestial magic of the heavens. Its haunting, ethereal light protects the Marai from the creatures that crawl from the abyss. Every hundred years or so, the moonstone’s light begins to dim. At that moment, the tribe chooses their fiercest warrior and bestows upon them the title of Tidecaller. The Tidecaller must plunge into the icy darkness of the rift, survive the horrors within and retrieve an abyssal pearl. If successful, the Tidecaller rises to shore where a luminous wanderer from Targon’s peak awaits with a moonstone to trade for the pearl. It is an arduous ritual that holds the fate of many in its illusive hands, but the exchange has kept the creatures of the dark contained. In the past, the Marai had sent troops of their most elite warriors to collect the pearl, but they learned the more forces they sent into the rift, the stronger the monsters became, as if it fed on their energy. While an army would be annihilated by the abominations below, a single scout – armed with a legendary Marai staff capable of controlling the tides – could potentially elude the dangers of the deep long enough to escape with the pearl. Nami had always wanted to be the Tidecaller, but she was impulsive and young. A fierce fighter, she was known amongst the Marai for her stubborn determination, which often got her in trouble. In Nami’s adolescence, the moonstone once again dimmed for the first time in a century. Nami attempted the trial of the Tidecaller. Due to her impulsiveness, however, the elders chose Rasha, a prudent warrior known for his level head in battle, as their Tidecaller. Rasha dove into the depths of the abyss. A week passed, then another. An entire month the Marai waited for their Tidecaller’s return, but there was no sign of Rasha. No Tidecaller had ever failed to return. The elders waited and argued while the moonstone grew faint, but Nami knew SOMEONE had to take up the mantle of Tidecaller soon, or all would be lost. Nami grabbed her mother’s bathystaff and plunged into the abyss. After several days, she returned with the pearl, the fallen Tidecaller’s staff, and a look of quiet horror in her eyes. Though furious at her impertinence, the village elders nonetheless admired Nami’s bravery and officially designated her Tidecaller. Nami ascended to the surface and rode the tide to shore to meet the landwalker. The stonebearer, however, was nowhere to be found. Instead, an elderly woman waited on the beach. The woman, whose grandparents bore witness to the last Tidecaller exchange, explained that there was no moonstone. The Aspect of the Moon was the only being who could conjure a moonstone, but she had fled Targon. Nami was unwilling to accept this. She vowed to find the Aspect and retrieve the moonstone. The lives of her people depended on it. Using the power of the mystical Tidecaller staff to summon a perpetual pool of moving water beneath her fins, Nami took to land to continue her quest. Determined, the Tidecaller swam into a brand new world." Nobody believed the girl. Even after they’d clothed her and calmed her down enough to speak in complete sentences, nothing she’d said made any sense. The villagers had seen their fair share of otherworldly things – living at the foot of Mount Targon made this an inevitability – but the child’s story didn’t add up. She’d described some sort of otherworldly humanoid who had risen from the sea that bordered their village. It sounded like a wanderer: one of the lost, confused celestial creatures who sometimes ventured from Targon’s summit. No one had ever heard of a celestial appearing from the ocean, though. More likely, the young girl was playing games. But when a woman with crimson eyes swam into their village, held aloft by a pool of water that ebbed and flowed at her command, the villagers realized it was no game. The villagers stared at her, mouths agape. Perhaps they were taken aback by her appearance. That would make sense, considering how unusual they looked to Nami’s eyes: flesh without scales and two backward arms where fins ought to be. Though they weren’t much in the way of conversation, Nami did have their attention. The villagers continued to stare at Nami, slack-jawed and mute. Only a sleepy, four-legged beast went unfazed by the appearance of the mermadic creature in the village, as it carried on pulling mouthfuls of dried grass from a wheeled cart and smacking its slobbery gums. Nami stood in the silence, tapping her staff awkwardly. It was as if the villagers had been frozen in place it was so quiet. Nami looked around the village and saw small, fluttering lights all around. Anchored to small pillars of wax or large, wooden sticks, the lights indeed seemed to be alive, but not sentient. They fluttered in the breeze and crackled with energy. An old man in golden robes stepped forward – the people of the oversky insisted on covering themselves, for reasons Nami couldn’t immediately understand – flanked by two sentinels. From the many layers of draped fabric, Nami deduced he must be some type of elder. Or perhaps he was just cold. Nami narrowed her eyes. The man’s lip quivered with silent rage. The moon’s Aspect was clearly important to him – but in what way? Did he worship and wish to protect it, or did he consider it an enemy? “–Fiend! I said fiend! You misheard me!” Nami shouted, but her pleas went unheard as the sentinels shouted orders. Many of the village’s people grabbed their weapons, dipping their spears into round containers of fluid and sparking them alight. Nami stared at the tips of the spears now flickering with orange light spirits. Their dance was mesmerizing, but radiated heat. Nami suspected touching one would be incredibly unpleasant. “You will leave this village at once! You spread FEAR and DECEIT, and we will have none of it!” the elder demanded. Nami stared at them for a moment, her face hard. This was it – her first test as a landwalker. She knew, that if need be, she could defend herself against everyone in this village. But that wouldn’t get her what she needed. “I am scared,” she said. The elder smiled. Nami did her best to ignore it. “Not of you, mind. I’ve looked into the hungry, hateful maw of darkness and thought I would never feel joy again. Your spears can’t compare to that,” she said. “And so, I’m not going to leave. Not while my people are still in danger,” she said. She moved forward and planted her staff in the ground. She moved with such confidence and fearlessness the villagers were taken aback – physically, in one unfortunate case. A young villager stumbled backward, his spear of heat skittering out of his hands, landing beneath the cart of dried grass. The dancing heat spirit grew taller. It licked the grass, spreading its own energy to the pile of dry hay. Within moments, the entire cart was ablaze with the hot, volatile energy. The grazing beast brayed in terror and turned away from the blaze. It kicked its muscular legs in confusion, knocking the cart onto its side, launching the burning grass into the air. The wisps of heat landed on the village’s thatched roofs and spread rapidly, consuming everything in its path with a voracious appetite. The villagers scrambled to fetch bucketfuls of water from a nearby well. Nami watched in frightened fascination as they hurled the liquid at the hungry spirits. For a moment, their efforts seemed to beat back the spirits’ rage, transforming the flickering glow into a horrible cloud of hissing air that, unlike the rest of the air in the oversky, seemed to expand with weight and form. The hissing smoke swirled as the spirits drank up the water and danced on along the rooftops, turning the blue night orange. I can help with that, Nami thought. 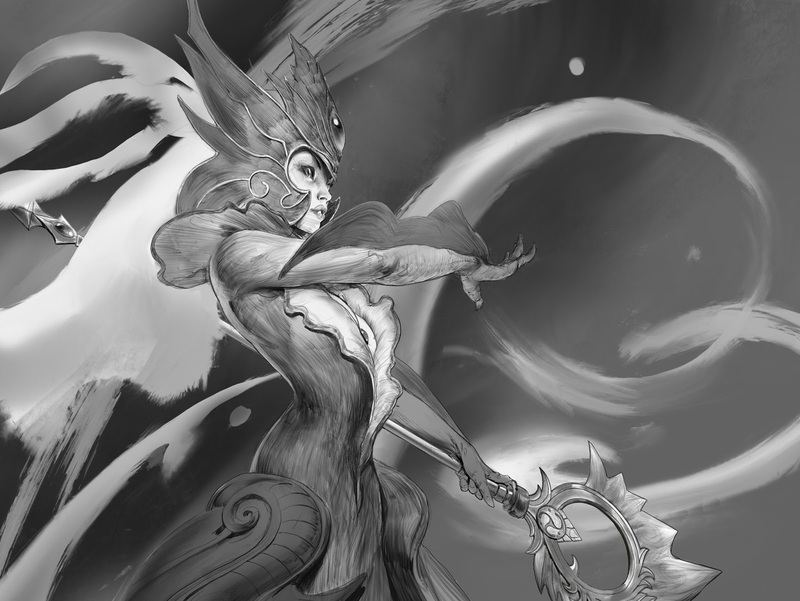 Nami raised her Tidecaller staff, her knuckles tight. Focusing her thoughts, the seawater lapping the village’s shore began to collect and vibrate. Nami tightened her grip and closed her eyes, pulling back her staff to draw the seawater toward her. The ocean roared. It stretched itself into the air high above the village, a sheer wall of tidal ferocity hovering at the ready. The people screamed. Nami thrust her staff forward, pointing its headpiece toward the dancing heat. “Please move,” she shouted to the villagers. The wave crashed forward as if to drown the entire village. Just before hitting the ground, the water twirled and twisted into an enormous, turbulent tentacle. It snaked through the air, sniffing out the ravenous trails of heat and rage. The tendril of ocean water encircled the angry light, coiling around it like a serpent, constricting and squeezing the brightness in a suffocating collapse. With one last smoky gasp, the spirits fizzled, their glow replaced with the quiet blue of night. Nami exhaled, loosening her grip on the staff. The tentacle of water lost its shape in an instant, and splashed to the ground to the startled delight of onlookers. The elder and his sentinels dropped their buckets. They turned to Nami, the rage they’d carried moments before now but a memory. They looked upon their visitor with new eyes. “The moon, look for her Aspect there – it’s a continent. That way,” he said, pointing out toward the sea in the direction Nami’s staff tugged her. Of course. The moon and the tide were as brother and sister. Wherever the moon went, the Tidecaller staff would be drawn. “Oh!” Nami exclaimed, her heart flush with hope. “That is – yes. Thank you. Sorry about the, er...,” she said, waving her hand noncommittally at the drenched, dripping village. Nami raised her staff and a wave reared up from the shore wrapping her in a cocoon of water and carrying her back toward the ocean. The elder called after her. And with that, the Tidecaller returned to the oceans, headed for parts unknown." "Rengar is a ferocious vastayan trophy hunter who lives for the thrill of tracking down and killing dangerous creatures. He scours the world for the most fearsome beasts he can find, especially seeking any trace of Kha’Zix, the void creature who scratched out his eye. Rengar stalks his prey neither for food nor glory, but for the sheer beauty of the pursuit. Rengar was born to a tribe of east-Shuriman vastaya known as the Kiilash, whose society venerated the honor and glory of the hunt. Rengar was born the runt of the litter to the tribe’s chief: a Kiilash named Ponjaf. Ponjaf believed Rengar’s diminutive size would make him a worthless hunter. He ignored his child, assuming the runt would starve to death. The young Rengar fled the camp, ashamed that he’d disappointed his father. He subsisted on grubs and plants for weeks until one day, he was nearly killed by a legendary human hunter named Markon. Upon seeing Rengar’s state, he took pity on the creature and let it live. Besides, this was no mighty vastayan warrior worthy of Markon’s blade. Rengar spent months following Markon, feeding off the corpses the hunter left behind. Rengar still hoped to one day rejoin his tribe, and so took great care in observing how Markon took down his quarries. After some time, Markon grew sick of the pathetic Kiilash following him around. He put a knife to Rengar’s throat and informed him that the only way to be a hunter was to hunt. He tossed Rengar the blade and kicked him down a ravine, where he was forced to make his first kill to survive. From then on, Rengar spent years pushing himself almost to breaking point. He scoured Shurima for the most powerful and dangerous prey. Though he would never be as big as other Kiilash, Rengar was determined to be twice as ferocious. Over time, instead of coming back to his camp each time with fresh scars, he began to come back with trophies. He polished a sandhawk’s skull to a sheen; he braided the teeth of a shrieker into his hair. Then, when he decided the time had come, Rengar returned to his tribe, ready to be accepted as a true hunter. Ponjaf scoffed at Rengar and his trophies. He decreed that only by bringing back the head of an elusive void abomination would Rengar be welcomed back into the tribe. Blinded by his eagerness to return to his tribe, Rengar allowed this wily beast beast to get the drop on him. The void creature ripped out one of Rengar’s eyes and escaped. Furious and defeated, Rengar admitted his failure to Ponjaf. As expected, his father chastized him. As Ponjaf spoke, Rengar noticed all the trophies adorning his father’s hut were dusty and old. The tribal chief hadn’t hunted anything in a long time—he’d likely sent Rengar after the void creature because he was too afraid to do it himself. Rengar interrupted his father and called him a coward. Many Kiilash were blessed with strong bodies or comfortable homes. Rengar, conversely, was born facing death. He had taught himself how to hunt, and had the trophies—and scars—to prove it. Even his own bloody eye socket was a trophy—proof that though Rengar was born with disadvantages, he never gave up. Rengar leapt onto his father and gutted him from neck to belly. The fiercest hunters of the tribe crowned him in flameroses, marking him as their new chieftain. But Rengar didn’t need his village’s acceptance. All he needed was adrenaline pumping through his veins as he chased down his prey. Rengar left the village, without pausing to take a trophy from what was left of Ponjaf—the chieftain was not worthy of remembering. Instead, he set off determined to find and kill the void creature that had tried to blind him. Not to satisfy the village, but to satisfy himself." Rengar smelled the blood before he saw the dead humans. Six or so, he estimated, but it was tough to get an exact count thanks to the number of pieces they’d been torn into. Their swords were strewn about the meadow, as useful as dulled cutlery. He knelt, licking blood from the ground. Cold to the tongue. Still sweet, yet bitter with the taste of iron. It had been spilled less than an hour ago. Turning over one of the stray limbs in his hand, Rengar found a line of greenish saliva dangling from where the arm had been ripped from its body. He raised the stump to his nose and sniffed. The saliva smelled foul, like a corpse that had rotted in a puddle of excrement. Just raising it to his nose nearly made Rengar want to vomit, and he had a stronger stomach than most. He smiled his wide, toothy smile. The creature who inflicted these wounds would be easy to track. Rengar watched from the brush as the razorhide worked its claws around an old man’s skull and crushed it between its boneteeth. It howled in disappointment, evidently unimpressed by the lack of a crunch. The giant, four-legged beast stomped through the elderly man’s tent, crushing it with a single step, then biting at the canvas and tearing it apart. 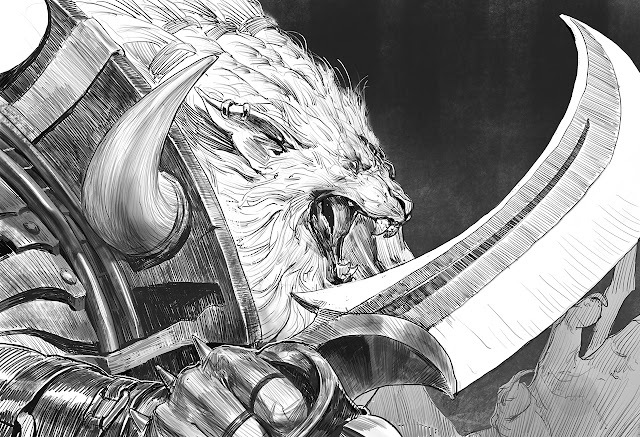 Tossing aside the man’s bedroll, it howled in delight as Rengar heard the scream of a young boy. Frightened. Good fear. Delicious fear. Pain on the back of its neck. Sharp and hot. Something bit it? No. Another pain, then another. Sharp stabs. Something with a weapon. Something with some fight in it. Rengar held onto the kirai saber with one hand as the razorhide bucked back and forth, trying to dislodge him. With his other hand, he grabbed a knife and punctured the beast’s leathery hide over and over. He knew he’d never kill the beast this way, but he’d get it bleeding. Confuse it. With any luck, panic it. The razorhide dropped to its stomach and rolled over, taking Rengar with it. It was fast—much faster than Rengar would have thought for a creature of its size. He barely had time to dislodge his blades and jump away. The two combatants got to their feet. Blood trickled down the razorhide’s scales, each one sharp enough to sever a limb. Combined, the scales made for a nigh-impenetrable defense and a thousand small weapons all at the same time. It circled Rengar, sniffing the air. Rengar could tell he’d never win a straight fight against it. It was too big, too quick, too strong. A lifetime of scars had taught Rengar the secret of hunting. It wasn’t about being strong. It was about knowing when to withdraw, and when to attack. Right now? It was time to withdraw. He sprinted away from the village toward the tall grass surrounding it. The razorhide leapt after him in pursuit, its feet pounding the earth. Rengar could hear it behind him. He could be hidden in the grass soon enough, but the razorhide would catch up to him long before then. He just needed a few extra seconds. One-eyed vastaya will be delicious. Only one thing tastier than something young: something that just tried to kill you. Stomp the cat-beast to death before eating? No. Better to swallow him whole, feel thrashing grow weaker and weaker until it deliciously stops. Some sort of weapon—three balls, tied together with leather—tangled around legs. Still. Broke free easily. But cat-beast gone. Only slight rustle in tall grass to show where he went. Bound into field after it. Cat-beast: small, scared. Warmth running down hind legs. From where? Behind? No cat-beast. Ran away again. Pain. New pain, in side. Annoying. Not problem. Just annoying. Start running. Doesn’t matter which direction. Put distance between us. Regroup. Turn around. Where vastaya? Maybe ran away. Maybe hiding, waiting. This was the best part. Invisible within the tall grass. His prey cautious, but not smart enough to be terrified. The momentary silence before the attack. Before the quarry realized just how helpless it was. Before the howls of pain, and the blood, and the adrenaline, and the joy. Rengar threw his head back and roared. Where roar coming from? Sounds like everywhere. Not roar of anger. Not roar of fear. No. This was a mistake. Out in the open. Run. Run back. The wound in the side. Deeper than it felt? Throat wet. Choking. Blood. Where is village? This way? No. The other. Vastaya still roaring. Still getting closer. Flash of metal. Cool air blowing on stomach. Feel self growing lighter. Sound of something wet and heavy hitting the ground. Many wet and heavy things. Look back. Guts. Fluid. A trail of red and green. Pain. Stinging pain, throbbing pain, stabbing pain. Everywhere. Can’t stand up. Legs buckle. Breathing hard. Hear footsteps coming closer. Sound of knife leaving sheath. Feel something. Something new. Something terrible. Not hunger, anger, joy. Rengar approached the prone razorhide, its feet still kicking at the air as blood poured from the massive slash across its belly. Its eyes were dilated. What trophy would he take? The skull? The mane? The creature lifted its head and worked its jaw, biting at the air out of anger or confusion. Rengar smiled. The creature’s boneteeth were sharp. Smooth. One of those would make an impressive addition to his necklace." "Wukong is a vastayan trickster who uses his strength, agility and intelligence to confuse his opponents and gain the upper hand. After finding a lifelong friend in the warrior known as Master Yi, Wukong became the last student of the ancient martial art known as Wuju. 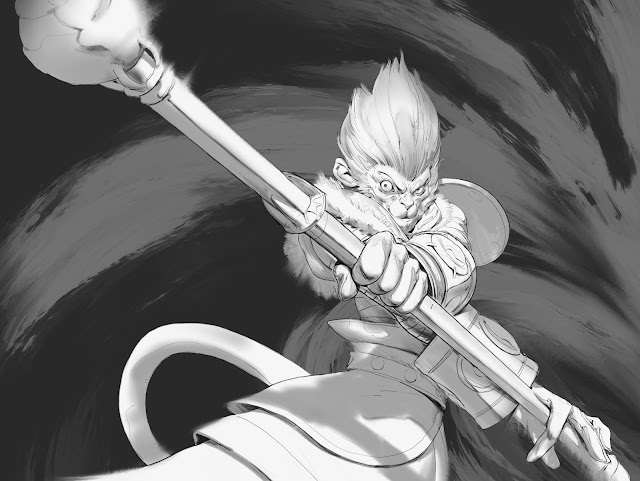 Armed with an enchanted staff, Wukong seeks to prevent Ionia from falling to ruin. 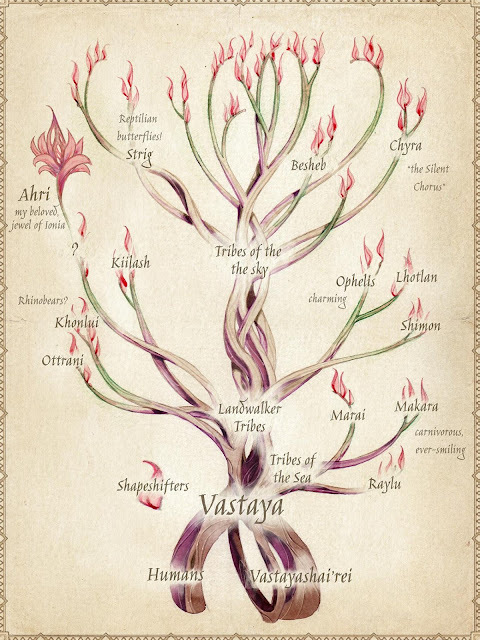 Within Ionia’s treetops dwells a vastayan tribe known as the Shimon. These apelike creatures are a wise, cautious people, and as pacifists, chose to build their society away from landwalkers, cultivating their society atop the tallest trees in Ionia. The Shimon see life as an evolutionary climb to wisdom, thus upon death, the Shimon believe they become stones, returning to the soil to begin the climb of life again. Even from an early age, Kong had very little in common with his fellow Shimon. Impulsive, clever, and fun-loving, Kong was a constant thorn in his village’s side. When war came to Ionia, Kong was engrossed by the sounds and colors of the battles below – they awoke something true and undeniable in him, a calling. Kong left his tribe to prepare for what he knew to be his destiny. Armed only with instinct and with no training under his belt, Kong wandered Ionia, in search of challengers to learn the art of combat. Though Kong often earned bruises and broken teeth for his trouble, with each fight, he was carving himself into the warrior he felt called to become. In his travels, Kong ran across a goggle-wearing man meditating in a glade. Kong challenged him to a fight. The man stood up and knocked Kong to the ground in a single motion before returning to his meditations. Kong had challenged many opponents, but he’d never experienced anything like this. For weeks, Kong came back to the glade every day and attempted to defeat the warrior. Though stronger and faster than the begoggled man, Kong was outmaneuvered at every turn. Eventually, Kong decided to try something he’d never attempted in his many years of life: humility. He kneeled before the man and humbly asked for training. Without missing a beat, the swordsman asked a question of Kong: why do you fight? Kong realized he’d never thought about that before. He could have stayed in his peaceful society, but something inside him had demanded otherwise. Kong asked the same question of the man, who only replied that he did not fight anymore. Kong spent the next several days sitting in the glade with the warrior, pondering the question. The man saw Kong’s change of heart and quiet determination. He introduced himself as Master Yi, and agreed to train Kong in the virtues of discipline, patience and combat, which Yi called Wuju. Kong’s technique and precision improved with each lesson as Yi channeled Kong’s propensity for recklessness and impulsiveness into a lethally swift and surprising fighting style. The two grew to respect each other over the course of this training, yet Kong sensed a deep sadness in Yi that even Kong’s most hilarious pranks couldn’t lighten. More than that, he still hadn’t found an answer to Yi’s question. Maybe if he’d known what Yi had once fought for, he could answer the question for himself. Kong made Yi a proposition. The two would engage in a friendly spar. If Kong won, Yi would have to tell him what he’d fought for. If Yi won, Kong wouldn’t speak for an entire year. Kong lured Yi from the glade into a field of smokepoppies, and each time Yi attempted one of his swift attacks, Kong would disappear into the haze the poppies burst with when agitated. In the confusion, Yi struck out at what he believed to be Kong, but instead was a straw doll Kong had woven in his own image and planted in the field as a decoy. Kong seized his opportunity and felled Yi with a blow to the temple. Yi smiled at Kong’s cleverness. The smile disappeared, however, as he explained why he had given up the sword. Yi was once an integral part of Ionia’s defense against Noxus during the invasion. Yi and his disciples had been so effective at meeting the Noxians in combat that the invaders had eventually turned to chemical warfare. Yi blamed himself for the hundreds of lives lost to their Zaunite scientist’s chem-bombs. No longer able to answer why he fought, he banished himself to the glade to meditate upon the question. Kong had come from a people who chose to stay out of the world’s fights, but all that did was leave those who might be less equipped to face those threats alone. Kong admired that, whatever the outcome, Yi had fought to protect others. Kong realized he wished to do the same. Through Kong’s eyes, Yi saw that he had been running from the truth: that, as much as he may try to deny it, he was a warrior and his people needed his help. A thankful Yi granted Kong an enchanted staff, crafted by the legendary blacksmith Doran, and a new honorific, reserved only for the brightest students of Wuju. From that day forward, Kong was known as Wukong. Yi and Wukong walked out of the Ionian wilderness, intent on finding a new cause to fight for. Together." "Fast and dumb, or slow and smart? And I’m not being humble. I’m good. Really good. Yi, humorless as he is, just happens to be one of the best warriors I’ve ever met. It’s not like the guy is slow, either: he’s fast. Faster than anyone I’ve ever seen. As in: he unsheathes his blade, then there’s a blur, then three guys are bleeding on the ground. That fast. Yi shook his head as hard as he could without rattling his goggles. I didn’t have to ask why. He likely wanted one of us to sneak around them and attack from the other side of the pass, trapping them in a pincer. Or something equally cunning and time-consuming. Yi’s big problem – apart from not finding me funny, and the fact that his goggles make him look like a man-sized bug – is that he spent the last handful of years sitting alone in a field of flowers. His patience is infinite. He thinks everything can be thought through. “Fast and dumb,” he said." To celebrate the new stories, all four champions have been added to this week's free to play rotation and a set of limited time champion and skin bundles are now available! Strange creatures called the vastaya have been sighted in Ionia - now they’re headed to the Rift and your local skins bazaar. Select from four vastaya on the free champion rotation and grab these limited-time bundles now through 5/02/17 at 23:59 PT.